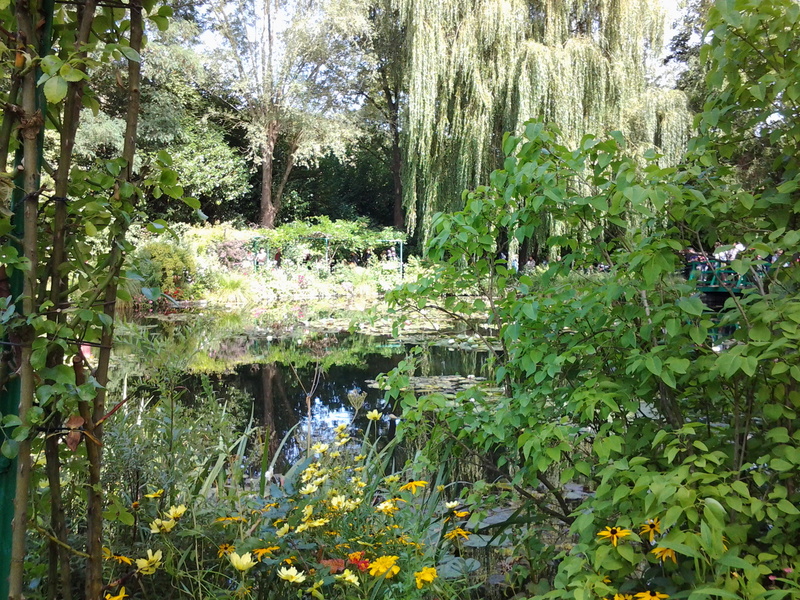 I remember my first visit to Giverny as if it were yesterday. 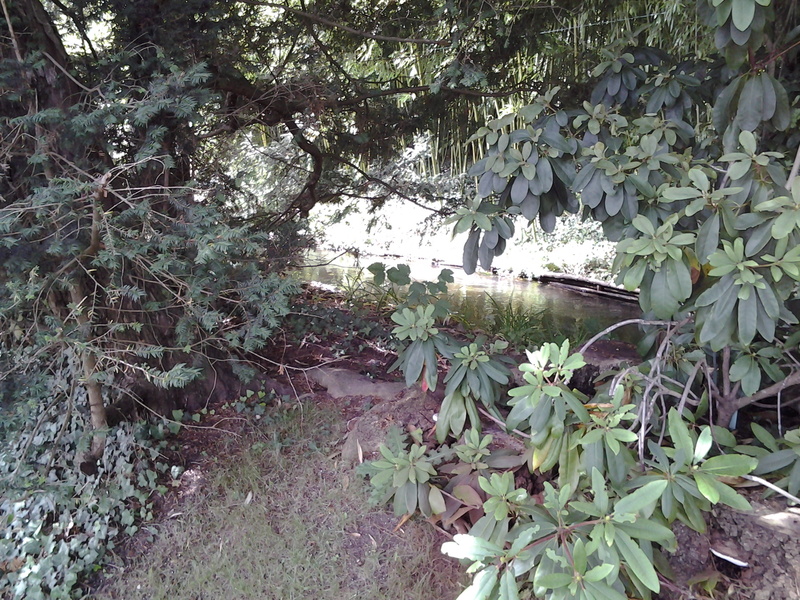 August, 2013….it was such a beautiful Sunday morning. I hastened to the train station in Paris to make my voyage to Vernon. A small town that allows a brief pause before boarding the bus from the train that will take you to Giverny. Pausing just long enough for you to gather your tissue, strap down your heart and promise yourself that you will maintain a calm demeanor when you finally reach Giverny. 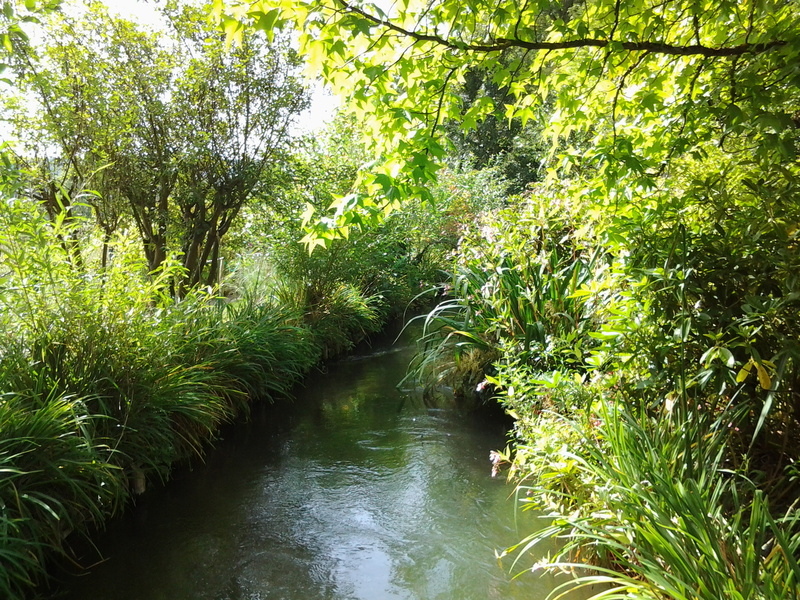 What is Giverny? Heaven….right here on in earth. 45 minutes from Paris by train where you then travel via bus or cab another 15-20 minutes…sort of off the beaten path…..however, worth it in so many ways. Claude Monet moved to this place of peace in 1883. I can only imagine that in his eyes, this was a canvas waiting to be touched, stroked and enhanced to become the work of everlasting art that it is today. This site was bequeathed to the Acadamie des Beaux Arts in 1966 by Micheal Monet. Michael wanted to continue to provide a safe haven for his father’s works of art that had followers coming from all around the world. Realizing the style of his dad’s works were not what was en vogue at the time, Michael wanted to be sure that someone would be there to provide the necessary means to share and protect the work of Claude Monet…the house where he painted in his last years and the gardens……oh yes the gardens. 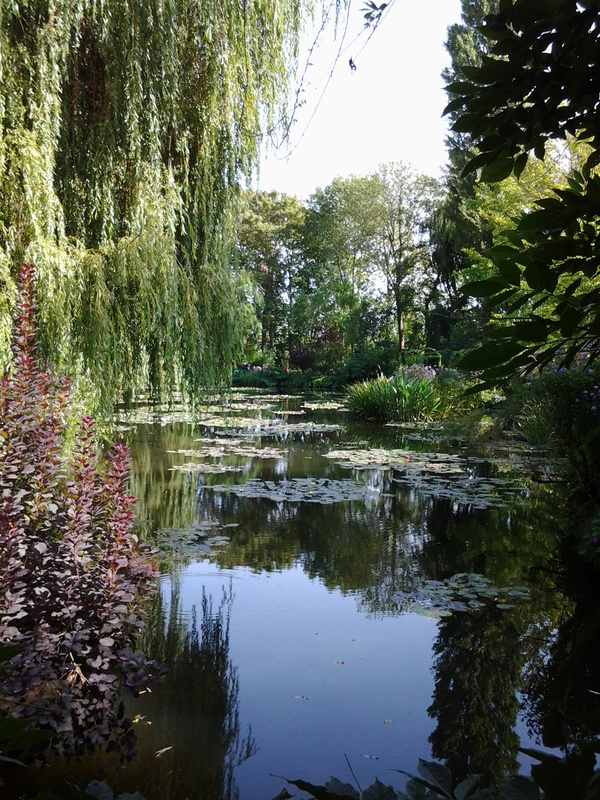 As a Steward of the Land, Lover of All Things Green and Giverny Fanatic, I had visions of coming to visit Giverny in 2015 and offer my services for a day, a morning or an afternoon, to contribute to the care of this place of peace and beauty. 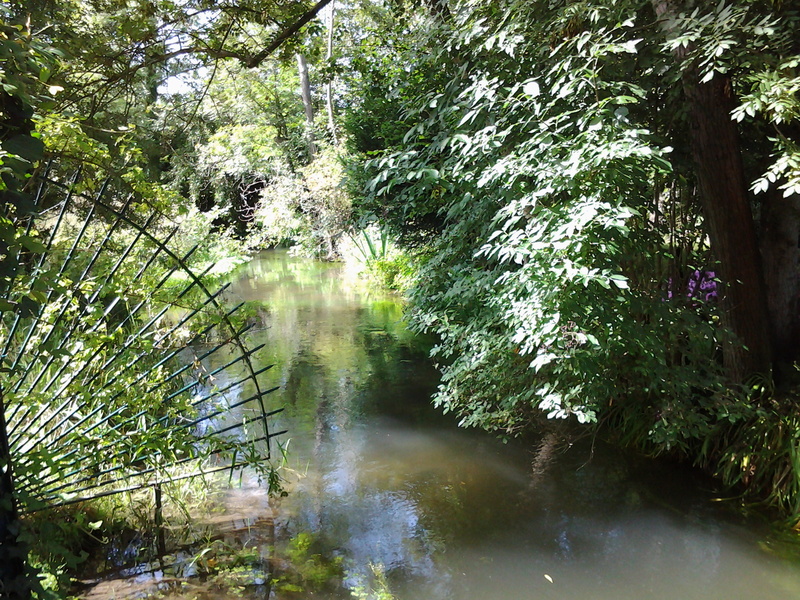 In my adoration of Giverny, I did not want to merely be a passing tourist. I wanted to participate, in my own small way to the efforts of maintaining this gift to us from Michael Monet. I wanted to say Thank you and honor his Dad, by pulling a weed or dead heading a Dahlia or just watering – if needed. I know, I dream big and volunteer for just about anything pertaining to gardening…this dream, in my mind was obtainable. The sounds of some very happy frogs, the chirping of some very grateful birds and the buzz of several bee’s add a touch of music as you wander amidst the beauty that surrounds you at every turn. 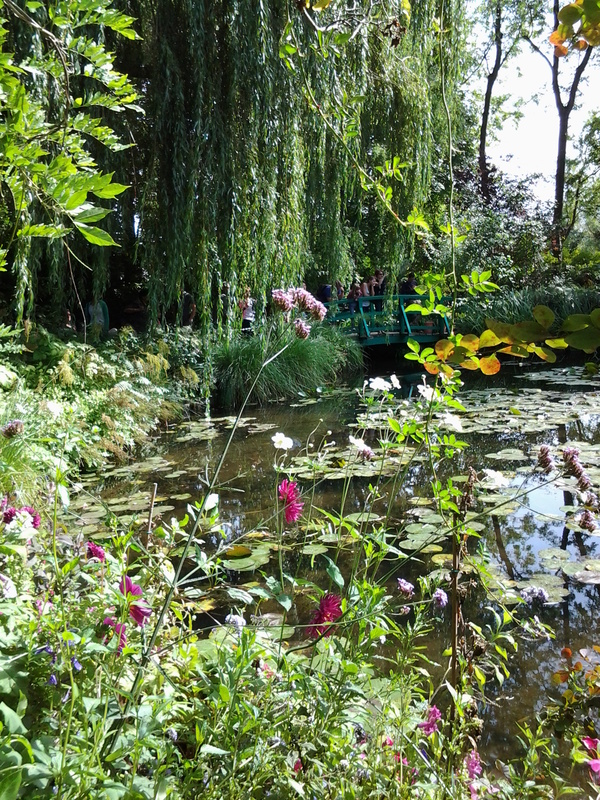 The clicking of cameras, the oohhh’s and ahhhh’s from others who are sharing this journey add to the awe that is Giverny. There are a few other people who also have the same idea, so for this year, my dream has been deferred. This year, I will once again visit and pay homage to Claude Monet and his Giverny. To see the gardens as they prepare to go into another season after a truly floriferous and colorful summer, makes my heart flutter. I am imagining the pears are ripening that were espalliered in the orchard by the house, the apples as well. I imagine the dahlias are simply showing off with abundant blooms in concert with annual flowers – performing their last curtsy before frost. Dreamer that I am, I will also imagine that when I look over the railing , I see Claude Monet getting out of his green boat, that at one time was in this pond surrounded by peaceful gardens, just beyond this bridge, waving at me and Thanking me for understanding his vision of beauty. Breathtaking photos for an utterly poetic post. Brava, Teri!